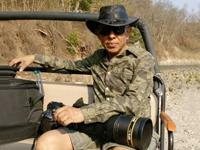 Akashendu Das is a path-breaking figure in Indian Advertising Industry and Wildlife World. Popularly known as Akash Das he has won many prestigious awards and has been a pioneer in the art of visual communication and wild life photography. Awarded one of the 10 most influential people in photography industry’ adjudged by Ernst & Young for Asian Photography and in February 2013. Akash is the only photographer whose black and white exhibition called ‘In Search of Asian Nudes’ got engraved in Limca Book of World Records as the first of its kind in the World. He has done 10 Solo exhibitions of his work in India and abroad including Miami, Paris, Hamburg & South America. He already has four coffee table books published to his credit and presently working on two more. His style of wild life photography has changed the way one looks at wild life. He calls it Art Wildlife. Inevitably the photographs have attracted much international attention and acclaim. With a sensitive socially conscious person he works closely with WWF on wildlife conservation issues. He has been long involved in the promotion of tiger conservation. In a conservative country like India, his campaigns on the social awareness of AIDS, homosexuality and adoption were challenging and remarkable; more so as they were promoted in the mid-eighties and the early nineties. That was a time, when there was terrible stigma attached to these concerns. He has many years of work experience with the top advertising agencies all over India. As a commercial photographer his approach has been a breakthrough and the demand for his work is exceptional. His work as a fashion photographer, have highly contributed to the complete change in the quality and perception of fashion photography in India today. He is one of the most prolific and commercially successful photographers in India today with a vast and varied portfolio.